As anyone who works in the real estate market or is shopping to purchase a home here in Lake Havasu, with historically low inventory, it is often frustrating for a motivated buyer to purchase a home. As of today there are only 275 single family homes on the market. Compare this to 427 homes for sale on July 31, 2017 and you see that we have 36% less homes available for purchase than we did one year ago. With 129 homes closed in the last 30 days, that means we have a 2.1 month supplies of homes (absorption rate). A 'normal market' usually has a 5-7 month supply. A lower than average supply means we are in a Seller's Market making it more favorable to be able to get your home sold than to being a buyer competing against a lot of other buyers. You may ask if we are going to continue to have all time low inventory or if the market is going to expand and level off. According to Dr. Lawrence Yun, Chief Economist of the National Association of REALTORS, 'the worst of the supply crunch may now have passed.' 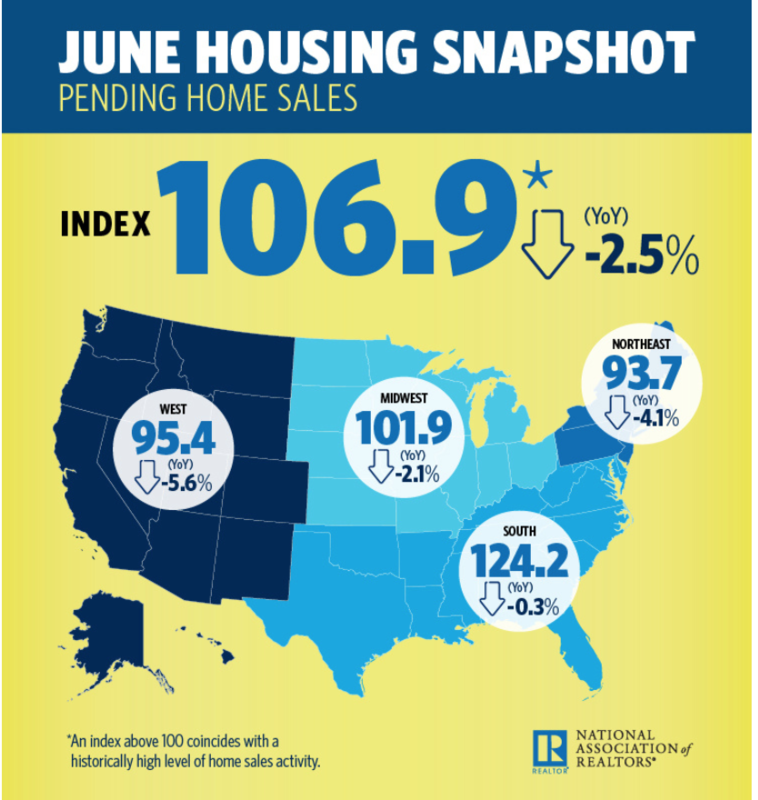 NAR's Pending Home Sales Index increased 0.9% from May to June. Meaning that less homes are being put under contract. This will allow the inventory to eventually rise. As you can see by this chart, sales in the west have gone down 5.6% year over year. Several large metropolitan areas have seen surges in inventory levels - Portland increased their inventory level 24% over last years levels. Unfortunately we have not seen those inventory increases in Arizona and more specifically in Lake Havasu. Because the home prices have increased year over year in double digits, we are seeing less buyers willing to compete in the market. When buyers start to pull back, inventory will naturally rise. It is just taking Arizona a little more time to increase. As we all know, the housing market is cyclical. However with the positive forces of strong economic growth and a healthy job market, housing is predicted to be healthy for both buyers and sellers. If you want to know what your home is worth click here. If you want to Search for Homes in Lake Havasu click here. Please feel to reach out to me if you have any questions regarding real estate in Lake Havasu and remember if you know anyone looking to buy, sell or invest in real estate, give me a call at (928) 486-3570.